I haven't watched a parade in quite a few years. 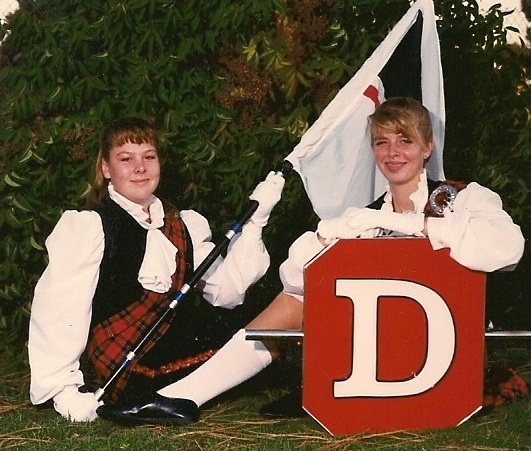 I used to have to BE in parades in high school when I was in the color guard (flags). That was a lot of fun. Especially the part where we got there really early and had to have our hair french braided so tight it made us look Chinese. Here's a nice blast from the past. 1990 I believe. That was my best friend in high school that I hardly ever talk to anymore. Sad. Anyhow, it would have been nice if someone would have told me my bangs looked so stupid. Then when I was older I worked downtown, right on the parade route. The building that I worked in had huge picture windows on the corner so we could actually sit up in the store window and have an awesome view. THAT was fun. The years of being in Girl Scouts got us in a few parades too. Not usually fun. One I remember the most was when it was raining. Wet little girls=no fun. So this year with Trevor being in football it was the first parade we've watched in awhile. The kids had to meet up to get on the huge truck. Talk about chaos! Think about 100 little boys running jumping and being boys. CRAZY! I was glad when they were all loaded up and we could go find a place to sit and watch the parade. We found Jessica and her friends and sat behind them. I got the "my mom is so annoying" when I asked if I could take a picture of them. She'll thank me when she's 36. Here comes the High School Band!! Did I tell you that Scott was in band too? He played the bass drum. Probably because he was the only one large enough to carry it without falling over. Here's the float that Jessica stayed after school to work on for about two weeks (inbetween powder puff practice). It got 3rd place. The them was Disney and they got Tomorrow Land. I'm amazed that kids can come up with ideas like this. That's a lot of football players!! I don't think they lost any. See that building behind them? That's where my Grandma worked FOREVER. Although it was a hardware store when she worked there. That building with the green top past that is where I worked and sat in the window to watch the parades. It was an office supply store. Now it's some kind of restaurant. This was the best part. The girl in the Belle dress held up a sign asking someone to be her "Beast". He gave her the thumbs up and then went out to get the sign and a hug. Too cute!! ﻿And finally, the homecoming King and Queen. I love their carriage!! Do you like parades? Were you in band? Cheerleading? Clubs? Homecoming Court? Wow, that looks like fun. We don't have high school parades here. We do have some cultural parades though in April where some high schools can participate. LOL ... neat photos.. even of your 'bangs' which are called a fringe here! How fun! Love the old photo from your HS years! We never had the same types of parades in the areas I have lived in...they look so fun and nostalgic!